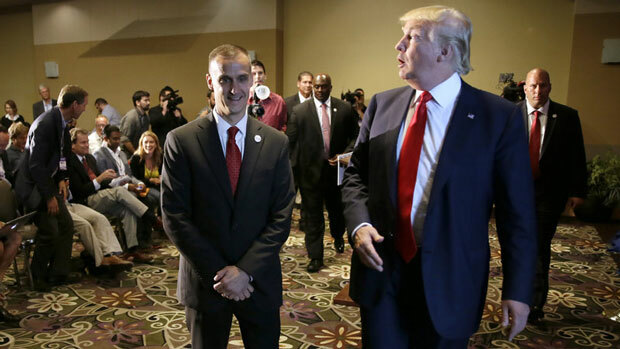 Republican presidential candidate Donald Trump with his campaign manager, Corey Lewandowski, in Iowa last year. Until last year, the architect of Donald Trump&apos;s presidential campaign was an obscure political operative in New Hampshire. On the night of his New Hampshire primary victory, Trump acknowledged Lewandowski&apos;s role in the win, asking, "Does Corey have a ground game or what?" That night, Lewandowski stood stage right to Trump, looking relaxed, a rare moment of rest for a man who&apos;s known among colleagues for chugging energy drinks and being in constant motion. Until Trump hired him last summer, Lewandowski had never run a national campaign. Now he&apos;s Trump&apos;s alter ego, comfortably telling interviewers that "it&apos;s time to send somebody to Washington who is willing to fundamentally change the system and make America great again. There is only one guy willing to do that: Trump." At 40, Lewandowski has spent half his life in politics, almost entirely behind the scenes and most recently as the New Hampshire director of Americans for Prosperity, the Koch-affiliated group. Lewandowski was unavailable for an interview for this story. Before signing on with Trump, Lewandowski was known in New Hampshire political circles as a hard-charging operative who was as unafraid to take on Republicans as Democrats. At the height of the Tea Party movement, Lewandowski mock-debated a cardboard cutout of former Gov. John Lynch at rallies. "You know he&apos;s in with both feet and both hands and he&apos;s working 100 miles an hour, and he was a formidable adversary or an incredible ally, whatever the issue is," said state Sen. Andy Sanborn, who got to know Lewandowski during this period. In his adopted hometown of Windham, Lewandowski tried to forge his own political career, running unsuccessfully for town treasurer in 2012. He also upended the town&apos;s politics, using public records laws to probe local government and launching robocalls targeted at voters to stoke outrage over a visit to the town by President Obama. "He was really interfering in town business in what I considered an inappropriate manner," said Kathleen DiFruscia, a former Windham selectman. Lewandowski remains well‐liked by other Republican political operatives although Ryan Williams, who advised Jeb Bush, cautions that Lewandowski never hesitates to get personal. "When I&apos;ve criticized Trump in this campaign, like in the press, he always responds by attacking me. &apos;Ryan Williams is just a paid Bush hack and he&apos;s just fighting for his job,&apos; or something like that, he&apos;ll say in response," Williams said. Lewandowski&apos;s fierce loyalty to the politicians who have employed him has shown few limits. When former Ohio Congressman Bob Ney faced prison on corruption charges in the Jack Abramoff lobbying scandal, Lewandowski vouched for Ney&apos;s character with the judge. When top Republicans in New Hampshire and Washington were trying to oust former U.S. Sen. Bob Smith in a nasty primary in 2002, Lewandowski signed onto Smith&apos;s campaign when many other operatives wouldn&apos;t.
"I mean this is a high-risk game. You&apos;ve got to take chances. And if you&apos;re right you look great and if you are wrong you take the blame for it," Smith said. "But Corey was attracted to that, and that&apos;s probably what Trump saw as well, that Corey is not afraid to take on the establishment." So far Lewandowski&apos;s gamble on the once-long-shot campaign of Trump appears to be paying off handsomely. The same may go double for Trump&apos;s gamble on Lewandowski.